DASHBOARD for Photoshop update is 3-in-1 and free. The Dashboard 4 Pro is a free Photoshop plugin that allows you to quickly search through all of your actions and launch them instantly. It also gives your own actions super powers, like one-click undo and paintability! The free Dashboard includes a collection of our groovy image enhancing and time saving actions. You can demo any of our other award-winning actions, or our borders and textures, immediately and purchase if you want to. There is no catch. You can continue to use the Dashboard and the essential tools for free, forever. It would be silly not to try it, so download it now! The Dashboard now combines all tool palettes in to one. Super Search! Normally, when you search, you can limit your searches to a certain category by using the category drop down menu. With Super Search, just type the * character at the end of your search and it will search everything, everywhere! Customizing! – Our actions were made to be flexible and customizable. All layers are kept in tact for your tweaking pleasure. Now, if you have a favorite way of modifying our actions, you can save our action with your modifications to the actions palette as a new action. Since the Dashboard reads all actions in the actions palette, your custom creations are also available via the Dashboard too! Batch Processing – Using the customizing feature, you can now batch process with any effect. Just export it to your actions palette and use the standard Photoshop batch processing tools! Better organized categories – general use categories are at the top, followed by a category for each of our action sets. Mini previews – our effects include miniature sample previews so you have a visual idea of what each action does! New graphics and sizing options make the Dashboard a welcome addition to your Photoshop workspace. This update is free to all our existing users and new users can also get the Dashboard 4 Pro free to control their actions or use our essential tools set. We currently have the default and carbon fiber skin designs available, but will soon have many more! What could be better than that? OK, fine, chocolate covered bananas are pretty good too. Watch the video at the end for an overview of how powerful the Dashboard is and how it is used. The new DASHBOARD comes in the default skin and my personal favorite, carbon fiber. You can install either one. More fun skin designs on the way! Dashboard update & fun skins now available! Be sure to keep your dashboard updated as we are actively adding new features and little fixes. It's easy to update: you'll get a notice when you log in that there is an update available. Switch to Adobe Extension Manager for the version of Photoshop you are using and you'll see your Dashboard plugin, with an option to update your plugin. Do it! You can now choose between the Classic Dashboard or one of our fun new skins. We currently have Carbon fiber, Leopard, Blue Floral, and Pink Floral. More cool designs will be coming too. You can easily install a skin and switch to another later. Just install the appropriate skin .zxp file in Adobe Extension Manager and restart Photoshop. Bam! 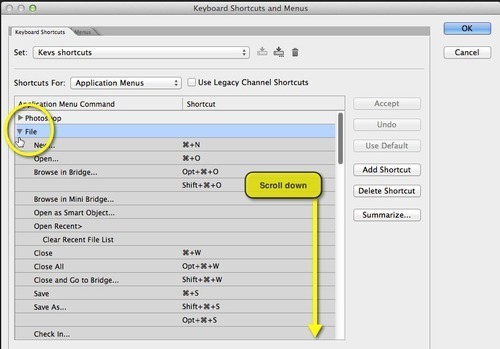 When you see “Activate Kubota Dashboard”, click in the shortcut column and assign your hot key. 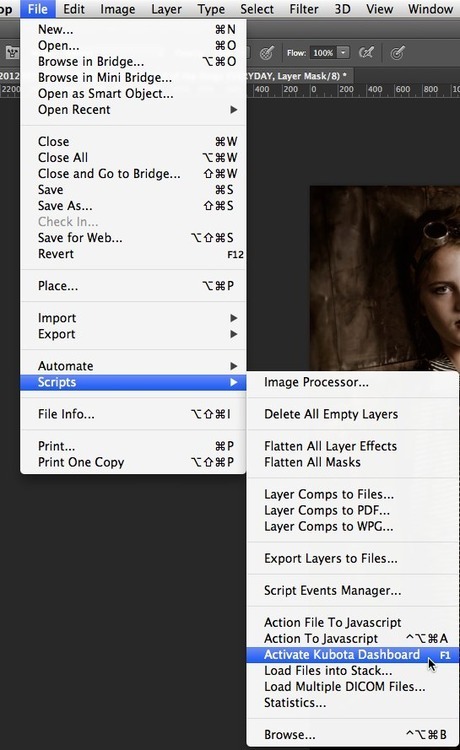 If you pick one that Photoshop already uses, you can override it or select something unique. 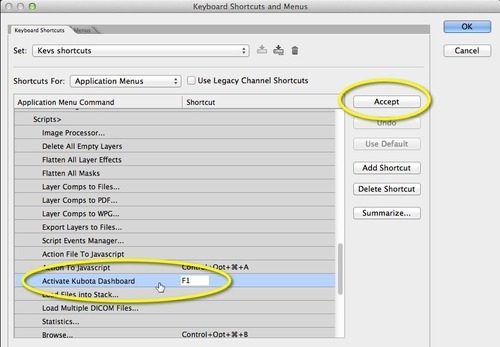 Click “Accept” to save the new hotkey, then close the dialog. When you go to File > Scripts menu again, you should see your hotkey next to the script.